The title is supposed to refer to gardening, but it could just as well refer to the blog post itself. I've made a very slow start on gardening this year. It started with, I wish I'd cleaned out the greenhouse in the autumn, when proper gardeners do it, and progressed through, Those brambles are getting out of hand, to, If the weather's going to muck around like this, what's the point? I couldn't bring myself to dig up that flowering broccoli, and the comfrey is a permanent fixture. ... shortly followed by peas. The raspberry cane in the middle of this bed was also left, obviously. The comfrey in the far corner is a recent development, but is becoming a permanent fixture. Both of these are just starting to show their first leaves, which lifts the spirits greatly. My friend Maggs gave me some plants - brassicas and curcubits - which also lifted the spirits. She offered them before asking whether I had any evening primrose going spare. I probably shouldn't have confessed to composting them - they grow like weeds in my garden - but I was glad to have a bucketful to give her in exchange. 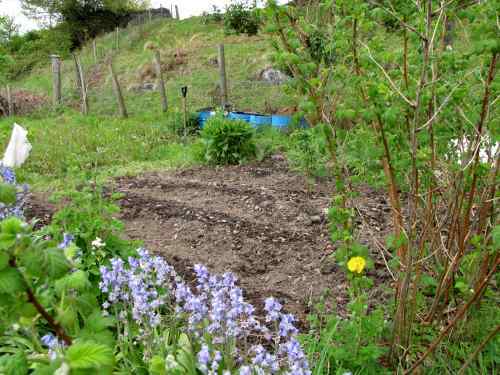 Today I finished clearing the bed for brassicas and other , so I should be getting those in tomorrow. 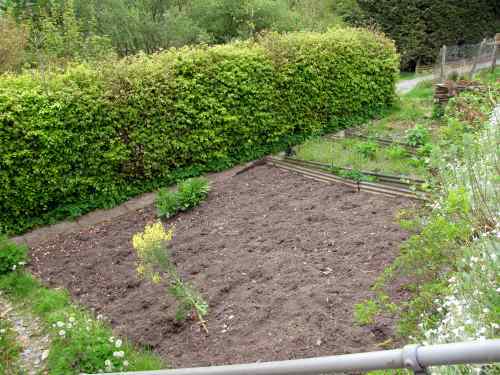 Maybe I will have a veg garden this year.